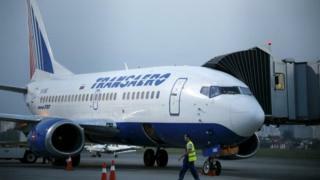 Kiev said the measures would take effect on 25 October and would include major Russian airlines Aeroflot and Transaero. Moscow described the move as "an act of madness", promising a firm response. In a separate development, Ukraine and Russia reached an agreement on supplies of natural gas to Kiev for the coming winter, ending months of tough negotiations. The deal - brokered by the European Union - was initialled in Brussels. However, it requires "further procedures" before it can be signed. Past gas disputes between Russia and Ukraine have led to interruptions in supply and caused major disruptions in shipments of Russian gas to EU countries. The flight ban was announced by Ukrainian Prime Minister Arseniy Yatseniuk. "Russian planes with the Russian tricolour have no business in Ukrainian airports," he said. Ukraine's aviation authorities later said the ban would take effect on 25 October. Last week, Ukraine imposed sanctions against 400 people and 90 legal entities - most of them from Russia - held responsible for Moscow's annexation of Crimea in March 2014 and the ongoing conflict in eastern Ukraine. Responding to Ukraine's ban announcement, Russian officials said they would be forced to take adequate measures. Dmirty Peskov, a spokesman for Russian President Vladimir Putin, said - that if implemented - such a ban would be "another act of madness". Almost 8,000 people have been killed since fighting erupted in eastern Ukraine in April 2014. Ukraine and the West accuse Russia of arming the separatists and also sending its regular troops in the Donetsk and Luhansk regions. The EU and the US have imposed their own sanctions against Russian officials and top allies of President Putin. A ceasefire in eastern Ukraine has been holding in the last two weeks, although there have been reports of occasional shelling.